These photos were from the September 15, 2018 Steuben German-American Friendship Parade. The first one was the starting point of our contingent. Different people came and went during the parade. The second photo is of Danny Dromm, one of the City Councilmembers. We were assigned to the Metropolitan Division. Kathy Jolowicz and Katrina Dengler were our Division (The Fifth Division) Marshals. We marched between Franz's Stammtisch and FC Bayern Fan Club. We marched to honor that great "gay" Revolutionary War hero, Baron von Steuben and want to respect the LGBT German roots of our history. For more information please email me at infotrue@yahoo.com and put Steuben in the Comment Field. 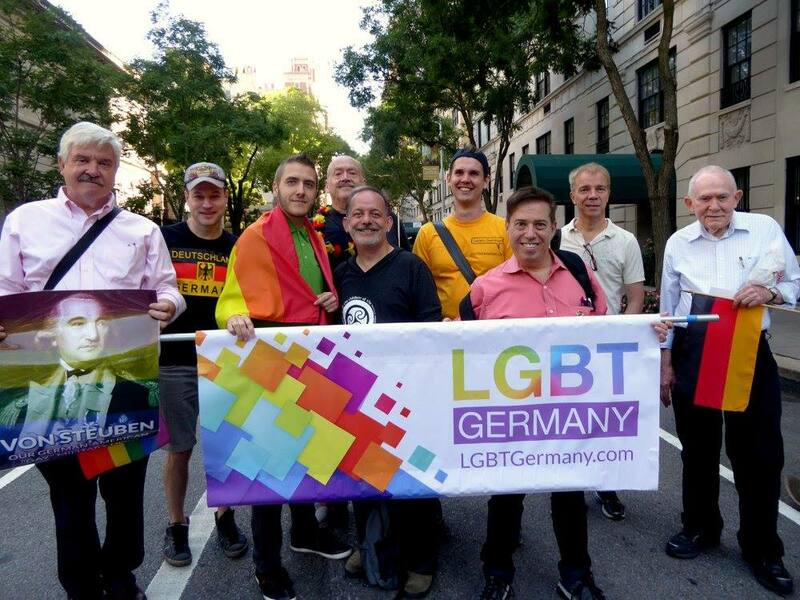 OUR GROUP JOINED GERMAN PULSE'S LGBT GERMANY GROUP IN THE NYC STEUBEN GERMAN-AMERICAN PARADE In 2016. Why did I organize our group? 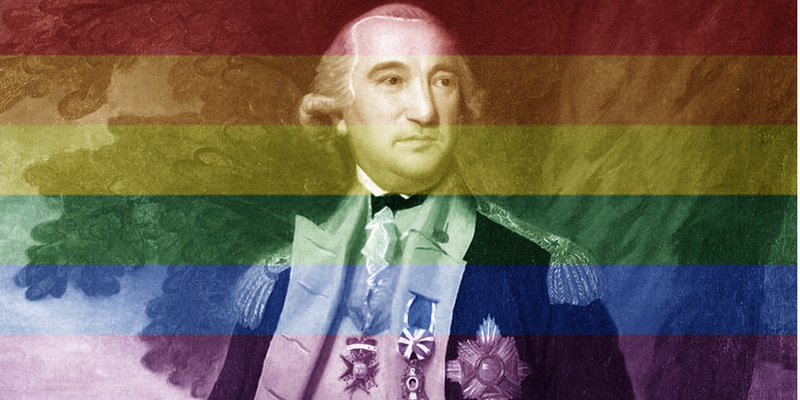 First, I wanted to let everyone know about who von Steuben was and how he fit into our LGBT and American history, and to realize that LGBT members should be included in all the Parades. Secondy, Germany was also the birthplace of the modern LGBT Movement in the 1880's. 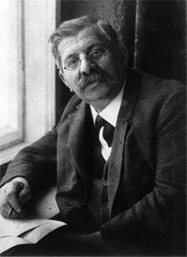 Dr. Magnus Hirschfeld came to America on his world wide tours to discuss his Berlin Institute of Sexual Sciences. Early homophile Americans like Henry Gerber heard him and was the link to people like Frank Kameney and Mattachine. 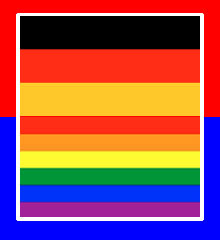 Click here if you want to go to the German Pulse LGBT Germany website. 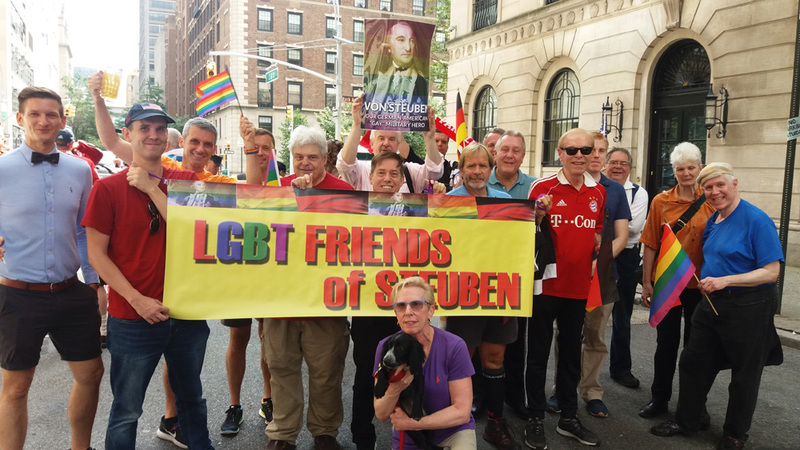 George Washington and Ben Franklin knew that von Steuben was gay, so this would be a wonderful afternoon to express the LGBT German contributions to America and have a good time. There is also a beer party after the Parade at Central Park. The goal is to have social/cultural events scheduled for people to meet, in addition to forming a list of friends to be able to contact when LGBT Germans come to NYC. We in the LGBT community have a lot of gratitude to show for the early German LGBT Rights Movement, with notable people such as Karl Heinrich Ulrichs in the mid 1800's and later Dr. Magnus Hirschfeld at the turn of the 20th Century; in addition to the earliest contribution to America by Von Steuben himself. That is why an LGBT contingent seems like a good idea. We should remember that the modern LGBT Movement actually started in Germany in the 1890's with the work of Dr. Magnus Hirschfeld, and Baron von Steuben has been credited with having a male lover and leaving him his estate in his Will. PLEASE CONTACT RICK LANDMAN at INFOTRUE@yahoo.com. Gay, Military Genius who became an American citizen. 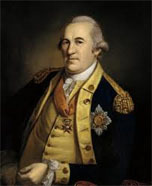 Von Steuben is accredited with the creation of a European-style army to counter the British. 1. Using social media to create a FACEBOOK group and contact other German websites, such as GermanyinNYC.org and meetup.com and the NYC LGBT Community Center. 2. To plan a social events, ie. 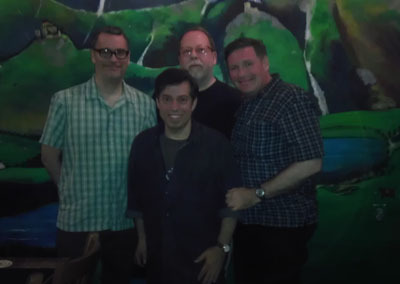 night at a German LGBT/friendly bar or restaurant. 3. 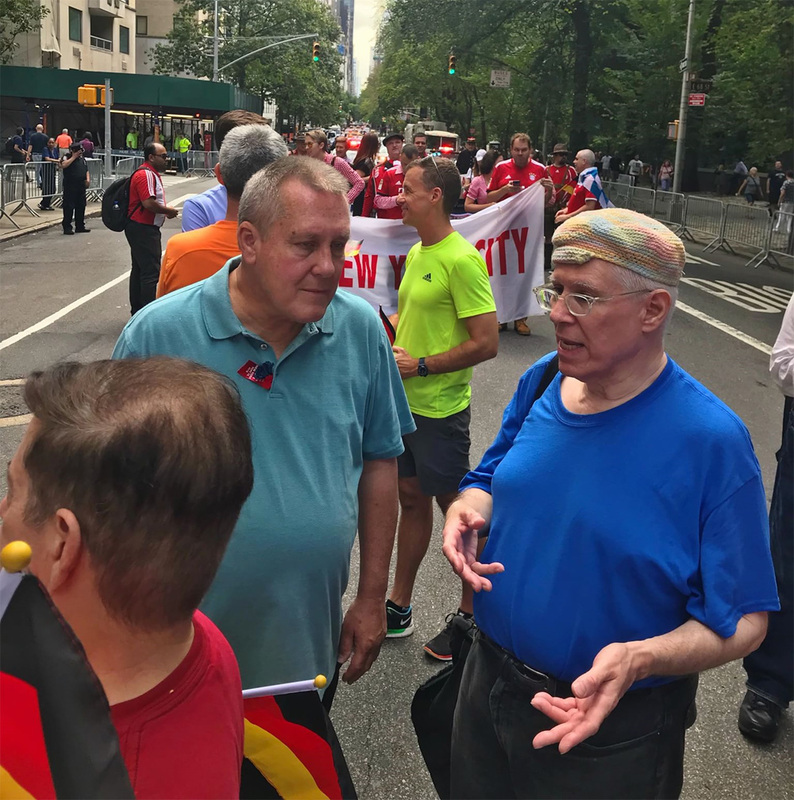 To plan a free Walking Tour of Lower Manhattan to explore German things with an LGBT tour guide who will also talk about the Rise of the LGBT Rights Movement in Germany (1890's) and New York (1970's). 4. To create a list of "friends" who visitors can contact for advice or informal get-togethers. 5. 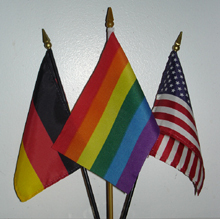 Learn about our links to German LGBT history. Not only was there Von Steuben, a gay German-American; but there was also Dr. Magnus Hirschfeld, who was a gay German who started the modern "LGBT Rights Movement" in Germany in the 1890's-1930's. Scan the page to read the German Pulse article about our group. But it is now being superseded by their group. A NIGHT OUT IN A "GAY-FRIENDLY"
We had our first Get-Together at the Lederhosen Pub at 39 Grove Street. We got together in June 2014 to discuss the future of the group and decided to have a Walking Tour over the summer. The first Germans to come to the "New World" went to the English colony of Jamestown in 1608. But by the 1680's, large numbers were present in New York. The period between 1840-1900 was the largest German immigration wave to America. Currently about 49 million or 17% of the American population can trace their ancestry to Germany. New York City was home to many famous German Americans. Babe Ruth, for example is of German ancestry as was the immigrant John Jacob Astor, and the immigrant John Peter Zenger (who fought for the freedom of the press), as well as the immigrant John Augustus Roebling who built the Brooklyn Bridge. The area in the East Village became known as Kleine Deutschland due to the large amount of Germans before the turn of the 20th Century. There are still many buildings that can be seen in this area with German signage on their facades. Other German areas of Manhattan included Yorkville on the Upper East Side and Washington Heights, which became the home of many German Jewish refugees. Before World War I, there was a clear German presence in New York City, with many buildings showing their Germanic roots. However, ever since the First World War, most things that showed anything German were removed from sight. Today, there is very little to see in Lower Manhattan that shows anything German. 1. The Customs House Building is by Cass Gilbert. In an early nod to political correctness, many of the sculptors were from, or descendants of, the countries they depicted. The armed female leaning on an antique shield is German, even though it says Belgium on the shield. In 1918, America was at war with Germany, and patriotic societies, including the 'Sons of the American Revolution,' protested the public display of an enemy insignia. The shield first read 'keil' and represented Kaiser Frederick Wilhelm II, the last Kaiser and then Germany's ruler. The sculptor Albert Jaeger (himself German) suggested changing the name to 'Democratic Germany' but refused other alterations to the statue because he had been decorated by Germany and did not want to be disloyal. Interestingly, the Germanic Lion remained. 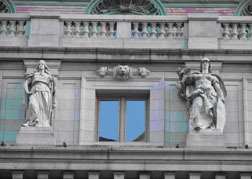 Cass Gilbert, the architect, negotiated directly with the Secretary of the Treasury William A McAdoo over the final appearance of the sculpture. Belgium was considered to be Germany's first victim in WWI. The limestone statue of a Viking woman, 'Denmark,' was originally conceived to be that of 'Norway' but Cass Gilbert changed his mind and decided that 'Denmark' should represent the Norse people. The sculpture is by Johannes S. Gelert. 2. 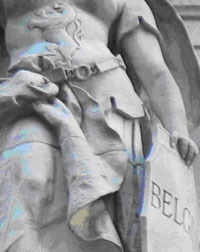 Close Up of shield showing Belgium instead of Germany. 3. Do you where this building is located? This is is the only place where I was able to find the word "German" on or in a building that was created in the 20th Century. While there are many buildings in the East Village (Kleine Deutschland) from the 19th Century with German inscriptions, I am still searching for anything German in Manhattan from after World War I. The stained glass skylight (was originally built as a functioning skylight until the additional floor was added over the skylight in 1919) was created by Heineke and Bowen, the same people who made the ceiling tile. The elevator door covers are by Tiffany. The skylight contains the date 1879 which was when the Woolworth company began and 1913 when the building was completed. It also lists the major trading countries in the world at the time. 4. 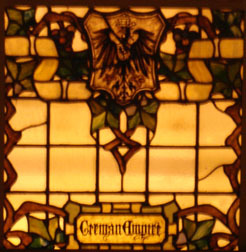 Here you still see the words, "German Empire" (and the Eagle) on the periphery of the skylight with other countries such as France, United States, Russia, Great Britain, Argentina, Austria, Spain, Italy, Brazil, Japan and China. 5. 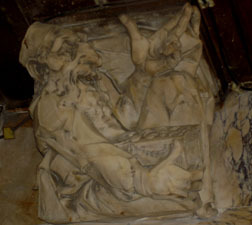 There is also a stereotypical gargoyle of a Jewish banker, something that would in years to come become a frequent topic of ridicule by Nazis such as Julius Streicher in his Sturmer Newspaper. I have not found a definitive story about who this gargoyle represents. 6. I have found the word German in another location in Lower Manhattan. It is at the entrance to the Brooklyn Bridge. It relates the story of the building of the bridge and how John Roebling was a German Immigrant. This is a new sign that was installed recently. 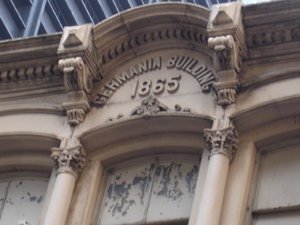 The Germania Building is now part of Century 21 Department Store.